Hong Young-pyo, floor leader of South Korea’s ruling Democratic Party, urged labor unions of large conglomerates to exercise restraint in their demands for excessive wage increases, addressing the need for not only stability but also flexibility in the country’s labor market. “We need broad labor market reforms that enhance both employment stability and flexibility,” Hong said Monday in his first parliamentary speech for the year. “Labor unions are adamantly against labor flexibility, equating layoffs with murder, while businesses argue that increased job stability adds to corporate burden,” he said. Hong made an appeal to labor unions of high-paying conglomerates and public-sector firms to help close the wage gap between salaried and contract workers by holding off their wage hikes for the next three to five years. 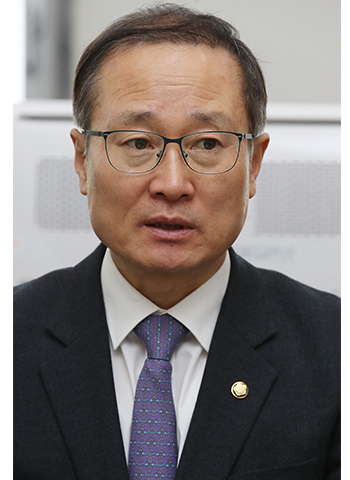 The comment from a senior ruling party member can suggest a shift in pro-union and labor-friendly policies under the liberal Moon Jae-in administration, which partly rose to power through aggressive campaigning by umbrella union groups. Hong urged other companies to benchmark SK Hynix’s model where employees earmark a certain percentage of their increased wages, with the company adding an equivalent amount, into a fund that supports partner companies and contractors. Hong also pointed to Denmark’s “flexicurity” model, which makes it easy for companies to hire and fire employees while softening the blow of unemployment through a generous social safety net. For Korea to reach the same level as Denmark in employment security, Hong said the country would need to expand unemployment allowances to 26 trillion won ($23 billion) from the current 9 trillion won. While calling for bipartisan support in building a viable social safety net by 2030, he stressed the importance of moving toward greater labor market flexibility so that businesses can adapt to fluctuations and changes in economic conditions, industrial structure and new technologies.